When your puppy or dog does something you don't like, you need to teach her not to do it. Here are three general ideas that should help you deal with most problems. Number one: Figure out why your dog is doing what she's doing. Is she following some deep instinct bred into her for many generations? Is she bored and full of energy? Has she discovered that this behavior gets her what she wants? If she barks in her crate and you let her out, she'll try that again next time—and she'll bark longer and louder because if it worked once, it'll work again eventually. Number two: Be sure that you're the one who's in charge. I had a Lab years ago that trained me to go get him a biscuit. I thought it was cute at first—he'd come and bark at me, I'd get up and follow him, he'd point to the dog biscuit box and bark again, and I'd deliver. Then I asked myself, “Who's training whom here?” Aha! I changed the rules of the game. If he came and barked at me, I told him “Sit” or “Down” and maybe a few other commands. Then sometimes I'd have a brilliant idea—“How 'bout a goodie?” Then I'd have him respond to another command—sometimes the ever popular “balance-the-biscuit-on-your-nose trick”—before giving him a biscuit. Other times I'd just praise and give him a belly rub. He still enjoyed the game, but I was back in charge. 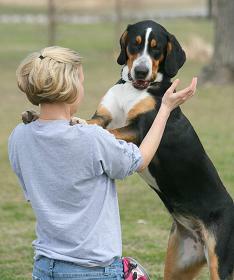 If you have a dog that tends to be a little pushy, make him earn what he wants by responding to various commands. You don't have to bore the both of you with “Sit” and “Down” forever. Teach him some tricks, and have him do one. He'll be a happier dog if he's sure you're in charge. Number three: Whenever possible, give your dog an alternative behavior to replace the one you don't like. I'll make some suggestions later for specific problem behaviors, but we can't cover everything, so hold this thought—it's much easier to teach your dog to do something than to teach her to do nothing. Believe it or not, your dog's goal in jumping on you is not to plant big, muddy paw prints on your shirt. So why does he jump up? Well, mostly because he likes you, and because you probably reward him for it part of the time by petting him, pushing him (which he sees as play), and paying attention to him. If you really want your dog to stop jumping, you need to be absolutely consistent about not rewarding him. Never put your hands on him to push him down and then pet him—the petting is what he wants. Don't try to knee him in the chest. Unless you're more coordinated than most people, you won't connect, and if you do connect, you could injure your dog. Here are two approaches that are safe and effective if you and everyone else in the family is consistent. One technique that works with some dogs is to completely ignore him when he's jumping. Wear old clothes for this one! When your dog jumps up, don't say a word. Fold your arms over your chest, turn your back on the dog, and look up. He may continue to try for a bit, especially if he's used to getting a more fun response from you. But eventually he'll decide that his jumping turns you into a very boring sort of person, and he'll quit. When he does quit, quietly have him sit or stand and pet him. Stay calm—you don't want to get him all excited. If he does jump up again, go into boring mode. This method requires patience from you, but it does work and is especially effective with puppies. Once your dog is convinced that jumping on you never gets him what he wants, he'll be reliable about staying off. Another approach is to give your dog a positive command—Sit or Down—before he jumps, and reward him for obeying the command. The problem with this is two-fold. First, he has to know the command, so the technique isn't reliable with young puppies or with dogs who aren't really trained to respond to commands reliably. Second, your dog may decide that if he jumps on you, you'll talk to him and reward him—what a fun game! > Mouthing, although annoying and even painful with those sharp puppy teeth, is a normal part of puppy behavior. Growling, guarding, and aggressiveness in a puppy are something else entirely. 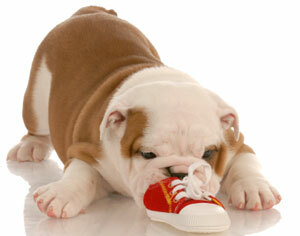 If your puppy shows signs of aggression, speak to his breeder and to your veterinarian. Don't ignore aggression in a puppy—get qualified professional help or return the pup to the breeder. 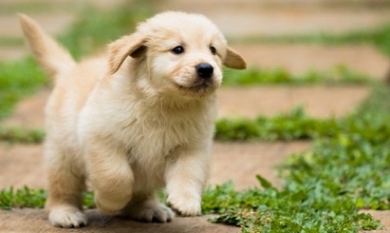 Puppies use their mouths to explore their world. They also use their mouths to play with other dogs. It's quite normal for a puppy to try to use his mouth to play with you as well, but he needs to learn that he must never put his teeth on a person. Here are two methods that work well with most puppies. One is to stop playing with the puppy the instant he mouths you. Just say “Ow!” and get up and ignore him for a minute or so. Then come back and play with him again, rubbing his tummy, throwing a toy for him to chase, whatever. If he puts his mouth on you, ignore him again. Many puppies will catch on very quickly. Others are more persistent. If your pup doesn't get it, don't just ignore him, but leave him completely alone for a minute or so. Then return. Again, it may take a few sessions, but if you and other members of your family are consistent and if mouthing just never pays off, he'll quit. Aggressive biting is something else entirely. If your puppy or dog bares his teeth or snaps at you or any other member of your family, or if he guards his food, toys, bed, or anything else from you, ask your veterinarian or obedience instructor for a referral, and talk to a qualified dog trainer or behaviorist who is qualified to deal with aggression. Do not wait! Dogs don't bluff. If your dog threatens you, take him seriously, and if he bites you or anyone else, get help immediately. Chewing is one of the great pleasures of life for many dogs. A nice, raw knucklebone or a good, hard chew toy can be the canine version of curling up with a good book. But if your dog doesn't limit his pleasures to things he's supposed to chew, he can cause a lot of damage and even hurt himself. Puppies in particular are champion chewers. Give your puppy ice cubes or “soupsicles” (low-sodium chicken or beef broth frozen into ice cubes). Give him high-quality chew toys made for dogs. If you feed dry food, soak his food in water for about 20 minutes before feeding him. When you can't watch him, confine him. Put anything you don't want chewed and anything that might hurt your puppy out of his reach. Prevention is by far the best way to deal with chewing. If your puppy or dog likes to chew things and rip things up, then he should never—I repeat, never—be allowed to be loose unsupervised with access to things he might like to have in his mouth. Crate-train your dog, and confine him to his crate when you can't watch him. Give him a nice legal chew toy or bone to play with in the crate. I don't advocate locking a dog up for long hours in a crate—four hours at a time should be about the maximum. If you have to be gone longer than that on a regular basis, arrange to have someone come in during the day to let him out for a while. When you're with your dog, keep an eye on him. If he picks up something he shouldn't have, gently take it from him while you say “Leave it” and give him one of his own toys. Be patient—it may take him a little while to learn what's his and what isn't. After all, he thinks, “your stuff all smells like you, and it's right there, and you're not using it, so maybe it's okay if I have a little chew?” Just teach him, and he'll catch on. Going for a walk should be pleasant for you as well as for your dog. But there's nothing fun about being hauled down the street by a determined canine. Even a small dog can pull like crazy—and a big dog can dislocate your entire body! Besides, having control of your dog on leash is important for your safety and his. If you're starting with a puppy, or your dog is small or reasonably easy to restrain, try the “no forward progress” approach first. When your dog starts to pull, stop in your tracks and stand still until he stops pulling. It may take him a few seconds to realize that you've stopped walking—that's okay. When he stops pulling, praise him and continue walking. If he pulls, stop. Don't worry if you don't walk too far for a few days. The important thing is to let your dog know that pulling is counterproductive. If that doesn't work on your dog, try a little stronger version of the same technique. This time, instead of stopping in your tracks, you change directions. Set your hands together in front of your waist with the leash grasped in one hand. This will keep you from jerking your dog. The idea is for him to correct himself, not for you to pull on him. As soon as he starts to pull, turn and walk in another direction. Don't stop and wait for him, and don't say anything to him until he catches up with you. Then praise him and occasionally give him a treat. Most dogs learn quickly to pay attention to where you are, and not to pull ahead. Always praise your dog when he does what you want. Some puppies and dogs, though, are just so strong and eager to see the world that they need more control. If your dog is one of these eager beavers, consider trying a head halter or pinch collar. These training tools need to fit your dog properly to be effective, and you need to learn to use them properly. A good basic obedience class (or some private lessons with a good instructor) is the best way for you to learn about both the right equipment for your dog and about training in general.